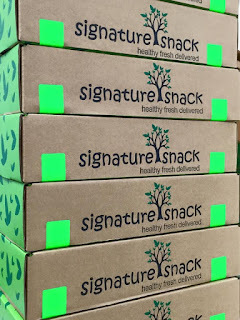 Do you want a freshly baked, naturally healthy and yet a delicious snack delivered monthly to your doorstep ? If the answer is "YES", then I'll guide you on how to do it but let me introduce to all of you what is Signature Snack. 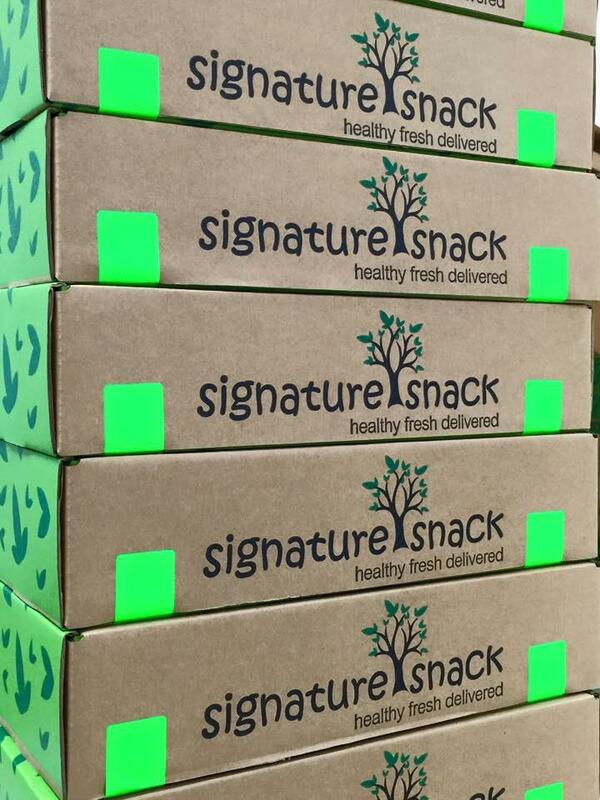 Signature Snack guarantee quality, freshness and great taste. They use 100% natural ingredients with no preservatives because they are good for us and the environment. My Little Angels' favourite is Salted Vanilla Cashew Crumble. It is half cookie plus half cashews. Delicious crunchy butter cookies mix with huge cashews. The ingredients used are cashew nut, butter, brown sugar, Himalayan salt, egg, natural vanilla extract and flour. Cashews was riched with magnesium, phosphorous and iron. Magnesium helps in building proteins and overall energy, phosphorous is essential for building strong bones and teeth and iron to keeps hair, skin, and nails healthy. My second selection is Roasted Pistachio in shell salted weighted at 115g. It is always delicious and exotic. Pistachio contain fewer calories, more potassium and vitamin K per serving than other nuts. It also rich with fibre, proteins, vitamin B-6, thiamine, phosphorus and magnesium. It is filled with essential nutrients and have a number of health benefits which helps you to control your body weight and lowering your risk for heart problems. The ingredients for this pack of Roasted Pistachio from Signature Snack was Pistachio in Shell and Himalayan Rock Salt. My next selection is Roasted Cashews Salted weighted at 135g. Delicately salty yet crunchy and delicious cashew nut is packed with energy, antioxidants, minerals and vitamins that are essential for robust health. They are nutty yet pleasantly sweet in taste. They can be relished as a garnish in various kinds of sweets and desserts.desserts. My next selection is Healthy Seed Mix weighted at 200g. It consists of pumpkin seed, melon seed and sunflower seed. Seed is another healthy food that you should consume a handful on daily basis. You can also mix it into salad. All the seeds are lightly salty to add a touch of saltiness. There are no salt granule as the salt are carefully infused into the seeds. Seeds may be tiny but they're packed with nutrients like protein, fibre, iron, vitamins and omega-3 fatty acids. It is vitally important physiological functions including the creation of ATP (adenosine triphosphate, the energy molecules of your body), the syntheses of RNA and DNA, the pumping of your heart, proper bone and tooth formation, relaxation of your blood vessels and proper bowel function. My 5th and last selection is Maple Caramel Cocoa Almond weighted at 110g. Consist of almond, cocoa, caramel and mapel, it is best to go with coffee or tea. The Maple flavour sweetness combination with chocolaty cocoa power and bitter almond mades the best combination to have a delicious snack. It is a good source of protein and fibre. I had choosen mine and let me guide you step by step on how to have it every month. Step 1 : Select subscription package. They have a few packages to cater for your monthly snack needs. Select your preferred snacks from their huge variety or you can just let them to surprise you with their best sellers snacks. 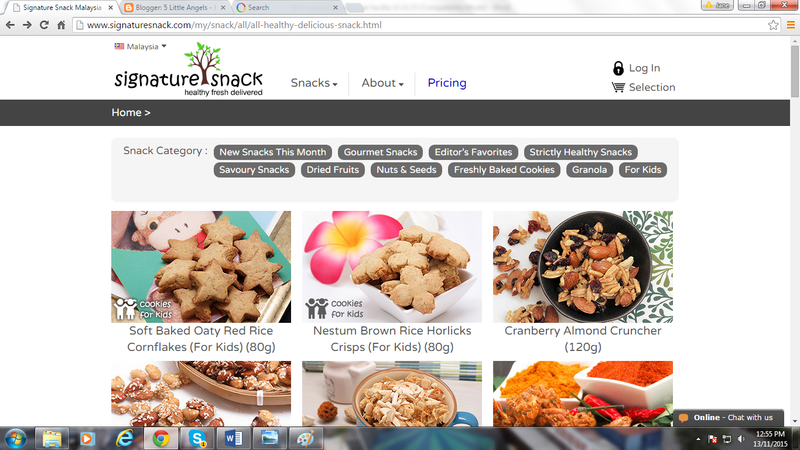 Snack Category include New Snacks This Month, Gourmet Snacks, Editor's Favourites, Savoury Snacks, Dried Fruits, Nuts & Seeds, Freshly Baked Cookies, Strictly Healthy Snacks, Granola and even specially made cookies for Kids. Good news as for the month of November, subscribe now at HERE for only RM39.90 instead of RM59.90 (RM20 OFF) plus FREE Nationwide Delivery. For more information and details, please visit their Website at HERE and Facebook at HERE or call them at 03-91083989. Me and my Little Angels always look forward for the signature snack to unbox ourselves the snacks that we had ordered every month. Within minutes of opening each snack, my Little Angels would had finish it off. It is so delicious and yet a healthy food. As a Mom, I always ensure my Little Angels will had enough nutrients. With signature snack, no more worries that my Little Angels will lack of vitamins in their body that will help them to growth healthily and happily. I also baked my own healthy snacks. This website look super convenient and healthy too. Cindyrina, good to baked your own healthy snacks but when you're busy, you might as well get it here. I do wish that I too can order these healthy snacks and have them delivered right to my door in Ipoh. Do you think that's possible? Emily, please wait patiently for their expansion. When they grow bigger, I'm sure they'll reach Ipoh one day. i have tried their snacks on different occasion. And yes, they are healthy, delicious and nutritious! good for those on clean eating diet. yes my favorite online store to shop. Lovely their snacks so much cannot have enough of them. Arisa, thanks as we really need to take good care of our health. Healthy snack. Some of the snack good to low down the cholesterol and provide fiber to our body. Agreed Betty. Let subscribe it to be healthy always. 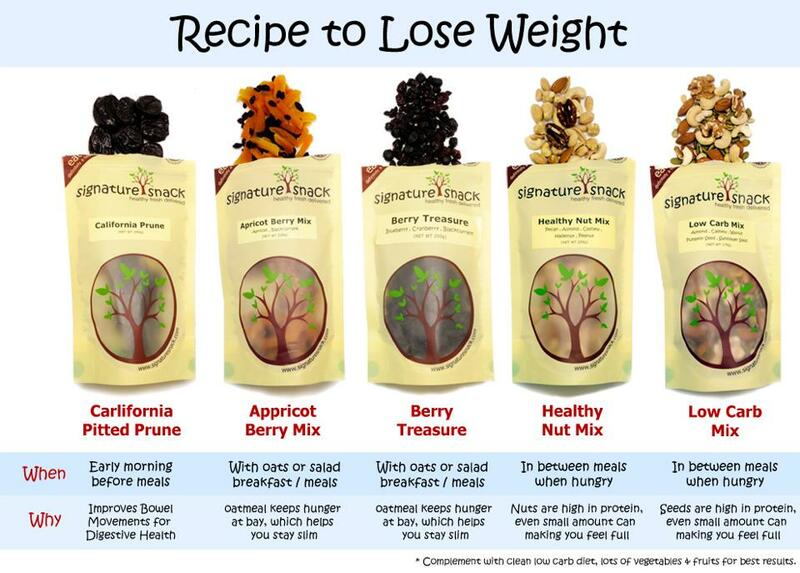 healthy snacks!! very attractive and i wish to have it so much during my stressful exam week haha. i want the healthy seed! Celine, you should have it to release your stress. Oh healthy snacks! Good to introduce this concept to Malaysians, we snack a lot on unhealthy food :( This is good! Renae, agreed. We need to start healthy now. Miera, I love their packaging too. It'll be nice if they have Pork Crackers. After all, it's really Healthy Snacks. Hard to get in Malaysia. I have to make my own most of the time. Mike, wow... Pork Crackers. I never try it before. Mind to share some to me ? I like the cashew nuts, next time I am going to order that. wow..look delicious.. want to order la..
Great Sienny. We love it too. Hanniz, true and to stay healthy. I love the concept and how we can order our healthy snack online =D My friends say that it was really nice and healthy snack to eat! 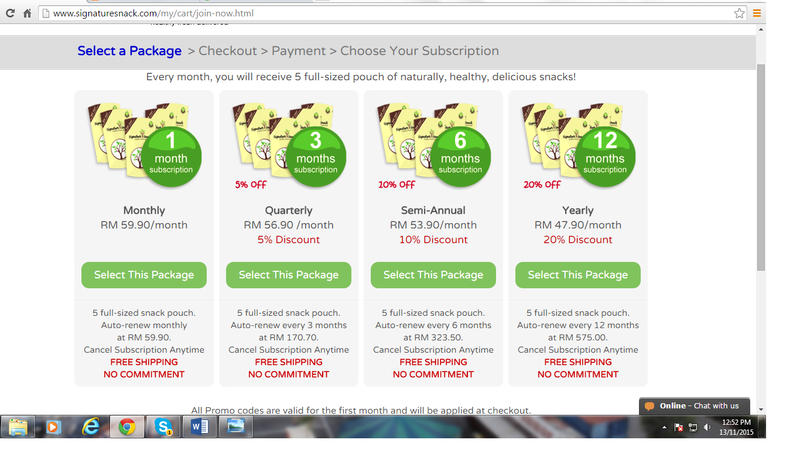 Sharon, 1st month subscription RM20 off from their normal price of RM59.90. 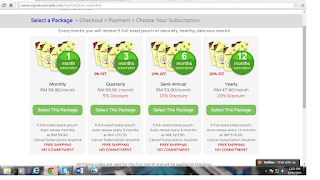 Just click at the link given and choose your subscription package and made the payment. 1 year old too young for snacks. For you and your hubby perhaps, Sabrina. You're most welcome, Ellie. Lets have healthy snacks together. Awesome! 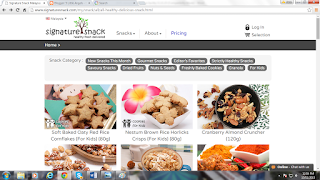 Can have healthy snack deliver to your doorstep! Maybe it can help me to lose weight lol! Anfield, yes it can as it had lower cholesterol level. Leona, me too as my Little Angels had it very fast. Within minutes, it all gone. Lovely snacks and we have got something similar here as well. Going to share that soon. Mums, great. Lets let our children to had a healthy life. Isaac, stay healthy with healthy snacks and we can enjoy eating too. 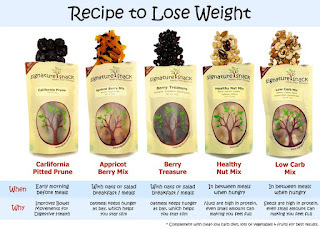 Love the fact that they make healthy snacks more convenient. Cant wait to get my pack! I'm loving it! Once start cannot stop@!